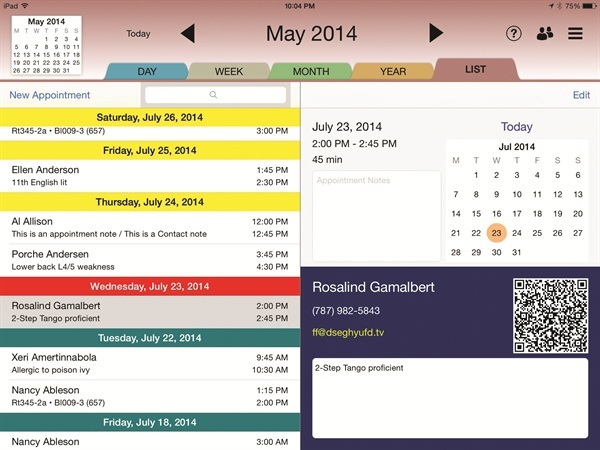 The Rendezvous Appointment Book for the iPad presents a simpler way to create and manage appointments. The Rendezvous Appointment Book for the iPad presents a simpler way to create and manage appointments. With the goal of replacing the paper appointment book, Rendezvous is designed for users who have found other calendar scheduling apps have more bells and whistles than needed. > Tap and hold anywhere on the day or week calendar, select a time, and the Appointment Entry form appears with a list of clients. Tap the client’s name, then tap to save. Plus, new clients can be added while making an appointment. > Rendezvous allows double-booking. More than one appointment can be scheduled to overlap for those times when multiple clients are being served. > A client “address book” stores clients’ names, phone, e-mail address, and notes. Clients can be brought in from Contacts or added manually — either way all historical appointment data and notes are archived and available at any time. > Client and appointment data can be backed up to iCloud. For more information, go to www.rendezvousenterprises.com.